Ravichandran Ashwin subjected a furious Jos Buttler to another 'Mankading' to derail the Rajasthan Royals as Kings XI Punjab went on to claim a controversial 14-run Indian Premier League win. Buttler looked to be on course for a century when he was unbeaten on 69 from 43 balls after the Royals were set 185 to win in Jaipur on Monday. Ashwin took matters into his own hands by whipping off the bails before going through with his delivery in the 13th over, with Buttler out of his ground. Buttler was at least warned by Sri Lanka spinner Sachithra Senanayake when he was the victim of a 'Mankad' in 2014, but Kings XI captain Ashwin did not appear to sound a warning before what was a pivotal moment. The Royals fell to pieces after Buttler departed, Steve Smith dismissed for 20 on his IPL return when KL Rahul took a stunning catch as they collapsed from 108-1 in the 13th over to fall short on 170-9. Chris Gayle earlier top scored with a magnificent 79 from only 47 balls, becoming the fastest batsman to 4,000 IPL runs, and Sarfaraz Khan made a rapid 46 as Kings XI posted 184-4. Gayle tormented the England bowlers during the limited-overs series in the Caribbean and he was at it again on the big stage. The opener brought up a 33-ball half-century by casually freeing his arms to clatter the expensive Jaydev Unadkat for six after dispatching the seamer for three consecutive boundaries in a 12th over that went for 19. Gayle also tucked into Ben Stokes, smashing him for six over long-off and another two boundaries in an eventful over before hooking the England all-rounder straight to Rahul Tripathi. Sarfaraz then came to the party, finding the ropes six times before finishing the innings by slapping a slower ball from Stokes over midwicket for a maximum. 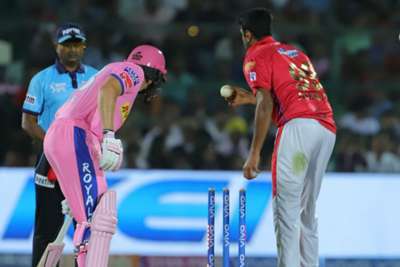 Buttler was in full flow when his innings was brought to a hugely controversial end by Ashwin. The opener could hardly believe what he was seeing when he turned round too late to see the India spinner run him out. Buttler was seething after the third umpire confirmed he had to go and Ashwin was in no mood to withdraw his appeal. The England Test vice-captain hit two sixes and 10 fours before his scintillating knock was brought to a contentious end. The Royals were still in a great position to make a winning start when Smith joined Sanju Samson at the crease, needing 77 to win from seven overs with eight wickets in hand. That gave Curran - who had been carted all over the park - a first IPL wicket and he had a second in the same over when Samson (30) was taken by Ashwin.